Which state of the Union consumes the most ice cream, per capita? You will never guess, but it is Alaska. Why? Ice Cream is a comfort food and when it is really cold, we turn to these foods to get us through the dark, wintery days. 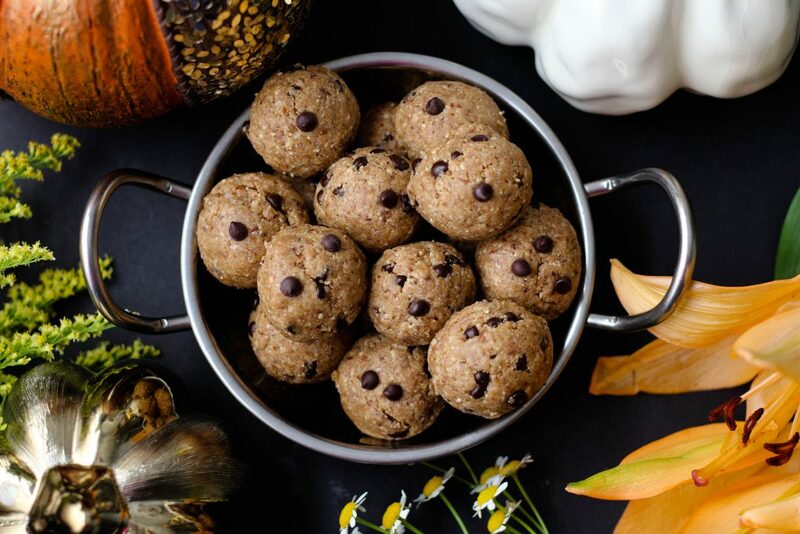 We know the issues with ice cream, so why not try something just as comfort-y but much healthier: pumpkin dark chocolate gluten-free paleo keto balls. Cold like ice cream..eating these pumpkin dark chocolate gluten-free paleo keto balls feels like eating raw cookie dough, minus the Salmonella scare. But even better these balls are chockful of fiber, healthy mono-unsaturated and saturated fats, and phytonutrients. What makes these balls unique? First and foremost the key ingredient are dates. Dates are nature’s preeminent sweetener, partly because it is the rare one where you are actually ingesting the fiber of the fruit. This slows down the rapid release of sugar and insulin in the blood. Plus dates are loaded with macro and micronutrients. Throw in the pumpkin puree, nuts, coco flakes, dark chocolate chips, chia seeds and you are looking at lots of satiating fats and fiber. It is pure keto, paleo goodness! 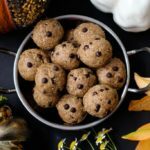 Why eat flour/gluten-laden diabetes-in-a-container cakes, brownies, cookies and alike, when you can eat these pumpkin dark chocolate gluten-free paleo keto balls that epitomize taste and healthiness. Put the dates in a bowl and cover with hot water. Soak for about 10 minutes. Drain in a strainer. Make sure you squeeze the dates enough to remove excess liquid. Place the nuts, coconut flakes, cinnamon, ginger, and salt in a food processor. Process until finely ground. Add the chia seeds, pumpkin puree, pumpkin spice, and vanilla. Process until thoroughly mixed. Add the dark chocolate chips to mixture. Transfer contents into bowl and make thoroughly with spoon. Scoop the chilled dough into 1-inch balls. Keep balls in airtight container in the fridge.